RACE AMONG SURIYA - DHANUSH - KARTHI - VISHAL? 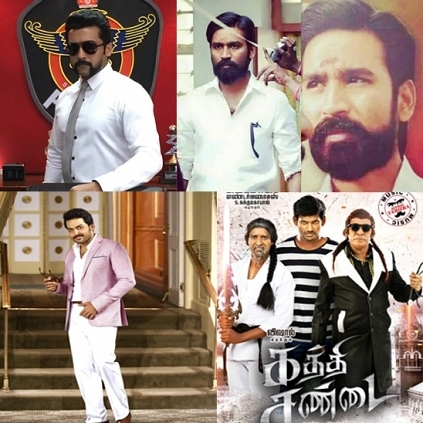 Diwali is always a special day for Kollywood, with films of big stars releasing in a grand manner. Last year’s Diwali witnessed the release of Ajith Kumar’s Vedalam and Kamal Haasan’s Thoongavanam. As told earlier, this year’s Diwali will see the releases of Karthi’s Kaashmora and Dhanush’s Kodi. The latest to join this list is Vishal’s Kathi Sandai. Official team members from these movies announced that their respective films will release on Diwali day. Apart from this, the recent buzz going around Kollywood circle is that, there are chances of Suriya’s S3 releasing on Diwali too. All the three confirmed films are very much expected by the audience, and we will have to wait and see if S3 will join this race. Who is going to release Baahubali 2? People looking for online information on Kashmora, Kathi Sandai, Kodi, Singam 3 will find this news story useful.